Next week sees the 15th anniversary of this much-publicised national recycling campaign and the theme this year is “Recycling. WE DO! Because it matters”. It has been created to reflect the consensus that the nation as a whole is now saying “we do!” when asked if we recycle. 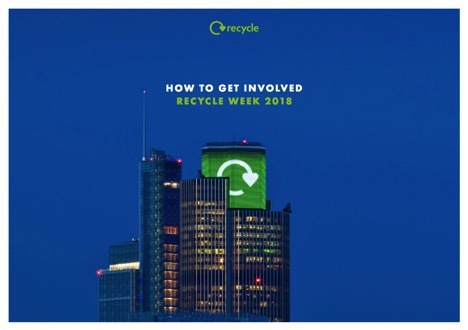 So organisers, WRAP (the Waste and Resources Action Programme) and Westminster City Council’s Commercial Waste Services would love to know what you, your colleagues, and your organisations are doing next week to show that ‘you do’. In fact, you are invited to tell the whole nation on social media with hashtags #RecycleWeek and #WeDo. Where to start in the workplace? With all the publicity surrounding recycling this year – particularly around plastics and the so-called “Blue Planet II effect” – there is strong evidence that people’s recycling behaviours are changing around the home and at work. In a recent study, 63% of respondents said they had changed the way they buy, use or dispose of plastics due to media coverage. So, you should have quite a warm audience in your workplace for any recycling initiative! Find out who are your sustainability or recycling champions amongst the workforce and how could you harness their enthusiasm to share with others in the workplace how easy it is to start? Conversely, how can you show the importance of recycling in the workplace such that your colleagues will change their behaviour and recycle more even at home? How can you dispel some of the myths about recycling that stop people bothering to segregate recycling and putting everything in the wrong bin? Do you have good recycling segregation signage and communications materials including an appropriate range of internal waste and recycling bins? Are those bins positioned where waste is produced and do they allow for proper waste separation without the wrong materials contaminating the recyclable materials? Do you separate out different recycling streams such as paper and cardboard, glass, plastic bottles, pots, tubs and trays, food waste, etc.? Do you have a carrier bag reuse station for anyone who is going out shopping and forgot to bring a reusable bag? Are you encouraging double-sided printing – and only when it is necessary to print a hardcopy? Your commercial waste collector should have lots of information on ways to reduce waste and improve recycling. Take a look at our range of guides on recycling on the Commercial Waste Services website here. Businesses across the UK are being asked to post “[YOUR ORGANISATION] DOES” on their social media and websites. Make sure you use the hashtags #RecycleWeek and #WeDo in your posts. There are some great Partner Resources on the WRAP website including this download on “How to get involved”. How will my business benefit from getting involved? Contributes to your Corporate Social Responsibility (CSR) work by helping you showcase your green credentials to customers and employees alike. Commercial Waste Services would love to help you recycle more. Why not book a waste audit with one of the team and they can show you how to increase the amount you recycle? Remember that nothing collected from you goes to landfill. The recycling we collect from you is reprocessed into new materials and when it cannot be recycled, it is used to generate low carbon heat and electricity for London homes and businesses.